The present Department of General Surgery is one of the oldest departments of the University and has facilitated the development of more than ten super speciality departments. The New Surgical Block (NSB) was inaugurated and dedicated for service on 16th January 1955. The department continues to evolve and is trying to keep pace with the fast evolution of minimal access surgery, rapid developments in various sub-specialities and new dimensions of surgical sciences. The Department of General Surgery conducts extensive undergraduate and postgraduate teaching program and research. Besides it is in the forefront of providing service. We deal with heavy emergency surgical work, which also entails attending the courts. There are currently 22 faculty members in the department (8 Professors, 3 Associate Professors, 11 Assistant Professors). The faculty is fashioned into 8 units (3 vacant seats have been advertised and selection process is underway)..
Advanced laparoscopic, endo-urological, thoracoscopic surgeries and modern procedures for thyroid, parotid, breast and anorectal diseases are routinely performed in our department. As encouraged and inspired by the Hon'ble Vice Chancellor each unit is performing specialized organ based surgery work in addition to general surgery. The faculty members are focussing on various sub-specialities like head & neck oncology, thoracic surgery, urology (including genito-urinary oncology), endocrine, breast, hepatobiliary, colorectal, ano-rectal and minimal access including bariatric surgery. 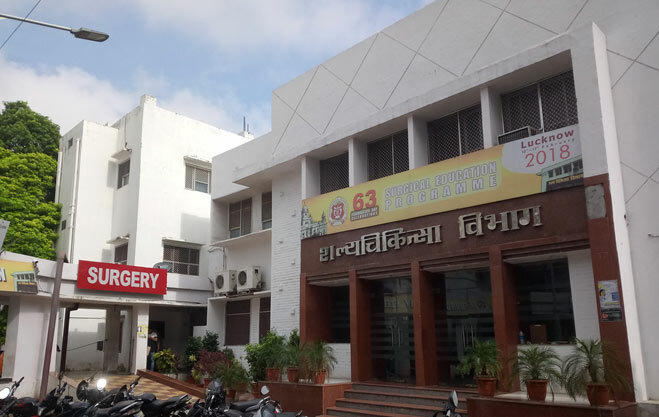 The concept of a composite department with its own building consisting of operation theatres with pre and post operative wards, research and project wards, clinical laboratories, services for sterilization, dressing material preparation, transfusion, stores, auditorium and offices was developed by Prof SC Misra. This bore fruit in the form of the New Surgical Block (NSB) that was inaugurated on 16th January 1955, by the then Chief Minister Sri Chandra Bhan Gupta, the Department celebrates this day as its foundation day. Six major, Endoscopic OT room, offices, skills lab, Two auditoria (200 and 80 seating), central stores, sterilization section, committee room, resident change, Cancer chemotherapy, library, Post-operative ward (16 bedded) with 3 bedded HDU and dedicated record section and UG/PG section. Four major, 2 minor ORs', offices, post op wards, project and research wards, Two auditoria (200 and 80 seating), central stores, sterilization, transfusion (non- functional) committee room, tea room, resident change, day care OT, Cancer chemotherapy, library, post-op, HDU (non-functional), record section. The department has 12 operating theatres - 8 in the New Surgical Block (including endoscopic OT), 3 in the Trauma Centre and 1 in the Outpatients' area. The Department was the first in north India to perform open heart surgery, neurosurgery, spinal surgery and plastic surgery. It caters the major reception to surgical emergencies including medico-legal cases. The department organises surgical teaching and training of MBBS, BDS, MS and PhD students. The department has trained a large number of general, plastic, neuro and cardio-vascular surgeons. The faculty, present and past, as well as the alumni of this department have won laurels for the institution, holding some of the highest offices in their professional organisations. Surgical Emergency in Trauma Centre - a vibrant place with all round surgical emergency and diagnostic facilities with 30 - 40 admissions per day in general surgery alone with referal from adjoining states and countries. The department has 10 operating theatres - 6 in the New Surgical Block, 3 in the Trauma Centre and 1 in the Outpatients' area. Department has 2 auditoria one with a seating capacity of 200 and 80 students each. Research: The Department has various intramural and extramural funded research projects currently underway for undergraduates, postgraduates and faculty. Conferences: The department regularly organizes teaching programs, CMEs, hands on training sessions,� workshops and conferences for postgraduates and practicing surgeons. The Annual foundation day is celebrated in month of February. The Department has been selected as North India centre for MRCS Part A examinations of Royal College of Surgeons of Ireland. The first examination will be conducted on 11th September 2018.